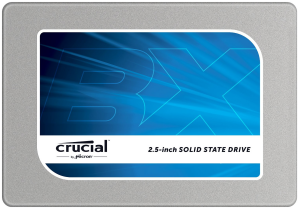 CDRLabs kicks off the week with a review of Crucial's new BX100 solid state drive. Aimed at the budget-conscious consumer looking to upgrade their system to an SSD, the BX100 offers substantial yet affordable performance gains. Powered by Silicon Motion's SM2246EN controller and available with up to 1TB of Micron's 16nm 128gb NAND, the drive delivers true 535 MB/s sequential reads on both compressible and incompressible data for faster boot up speeds and shorter application load times. Also, with Crucial's Extreme Energy Efficiency technology, the BX100 is two times more energy efficient than a typical hard drive, allowing users to run their systems longer, using less power. Crucial released firmware MU02 the day after we posted our review. Improved Device Sleep and Slumber transitions. Corrected SMART attribute threshold values. Improved general reliability and stability.